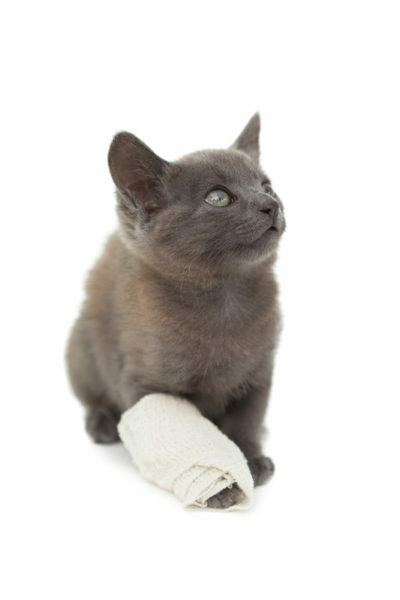 If your cat has been injured or is experiencing a medical emergency, call your veterinarian before you attempt any type of first aid. Always make sure to speak with your veterinarian and/or with a poison control specialist prior to initiating any therapies at home. Never administer any over-the-counter human medications to pets without speaking to a veterinary professional first. Create a notebook or index card with important phone numbers and addresses. Store it in sealable sandwich bag to keep dry. Use a sealable waterproof container like a toolbox or hard covered lunch box to contain all of your first aid supplies. For more suggestions about how to create a pet first aid kit, visit the Pet Poison Helpline resources.